“Sen. Jeff Flake has written a brave book,” said The Economist. A call for his party to reject Trumpism and reembrace the values of his mentor Barry Goldwater, the 140- page broadside may well cost Flake his Arizona seat next fall. No other Republican on Capitol Hill has issued such a substantial challenge to the president or other party leaders, and “bang on cue,” Trump’s media supporters, including Mark Levin and Laura Ingraham, have attacked Flake as a liberal in disguise. That’s silly: Flake has long been anti-tax, anti-abortion, and pro-gun. 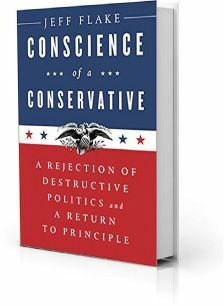 His crime is pointing out that conservatism once stood for a set of fixed ideals. Trump gets the worst of the book’s most newsworthy passages, said James Hohmann in The Washington Post. Flake describes the president as a carnival barker whose open admiration for dictators and disregard for truth have put sacred institutions at risk. And he’s not much easier on his Capitol Hill peers and how they navigated 2016. “Never has a party so quickly...abandoned its core principles as my party did,” he writes. But Flake is still more compelling when he describes the roots of his worldview. As a Mormon, he can’t forget that Missouri once made it legal to kill his religious forebears. As a young ranch hand, he once worked alongside undocumented immigrants he admired. Both memories remind him to distrust government overreach.